While denizens of New York City’s hippest neighborhoods are tap-dancing or signing away their organs to gain entrance to a prohibition-style bar tucked behind a LaCroix display in the Williamsburg Whole Foods this weekend, folks in Fort Greene and Clinton Hill will be doing something even wilder: going out to eat. As it turns out, the antiquated art of walking into a restaurant, sitting down at a table, and ordering from a menu is alive and well. 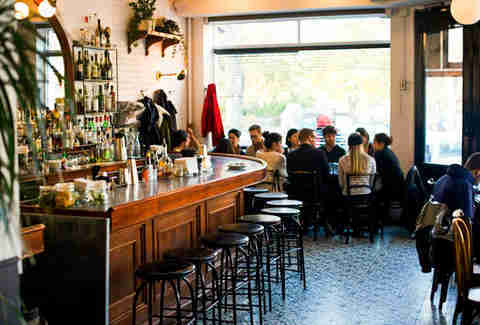 In fact, in most NYC neighborhoods, rather than seek gimmicks, locals still seek restaurants. 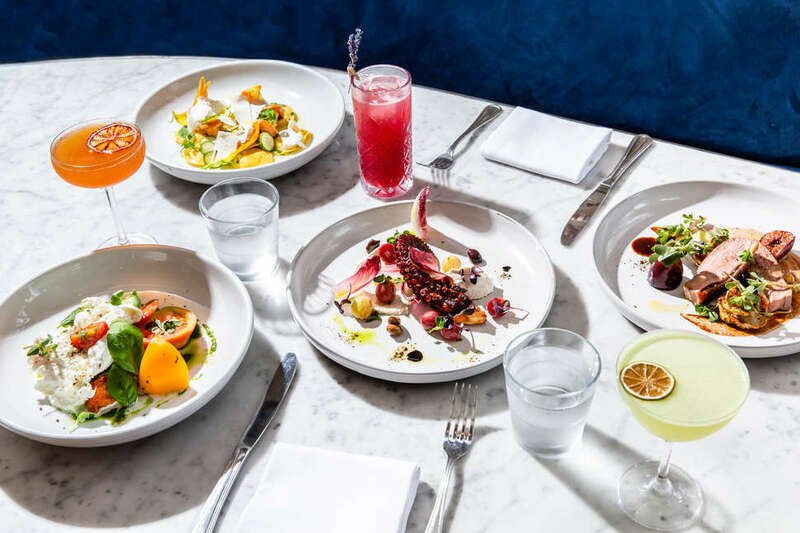 In Fort Greene and Clinton Hill, you’ll find a humble Michelin-starred kitchen, a buzzy raw bar, and even a pseudo-speakeasy -- none of which demand prohibitive wait times, or the sacrifice of your first-born child. You’ll find cafes and bistros that have been operating since before you cut teeth. You’ll find a new favorite spot, or three, and you’ll curse the fact that you (or a generous relative) didn’t buy property here back in 1975. You’ll also regret learning to tap dance for the sake of bar admission. Now, we’re not above gimmicks or the Williamsburg Whole Foods. Both are great in moderation. 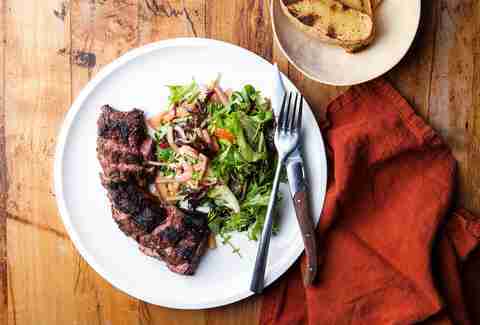 But sometimes, you just want dinner and drinks, and this pocket of South Brooklyn might very well be home to some of the greatest, easiest meals you could eat. And odds are, walk-ins are welcome. Here are all of the best restaurants and bars along the C Line in South Brooklyn. This is the neighborhood restaurant Brooklynites dream of. Sidewalk seating wraps around the relatively quiet Fort Greene corner, and wide windows let the light into an airy dining room. Chef Lanfranco Paliotti (Daniel, Boulud Sud) reconsiders his menu daily, depending on on each morning’s market offerings. Fresh pasta is hand-pulled in house, and bacon comes sizzling from the spot’s very own smoker. A dish you loved will evolve from one visit to the next, but plates of charred octopus, rigatoni with oxtail ragú, and a 40-day dry-age prime rib are here to stay. Try not to develop an attachment to any one dish at Roman’s, where the menu changes daily. You’d have to make it through legions of dinners to see that short rib-stuffed agnolotti for a second time. The white-tiled Italian spot from the duo behind Williamsburg’s Diner and Marlow & Sons built its reputation for freshness by tacking hand-scrawled menus to the front window each day. The menus come typed now, but they’re still posted in the same spot, boasting a handful of small plates, housemade pasta dishes, protein-heavy entrees, and an evergreen dessert option -- the decadent chocolate sorbet. 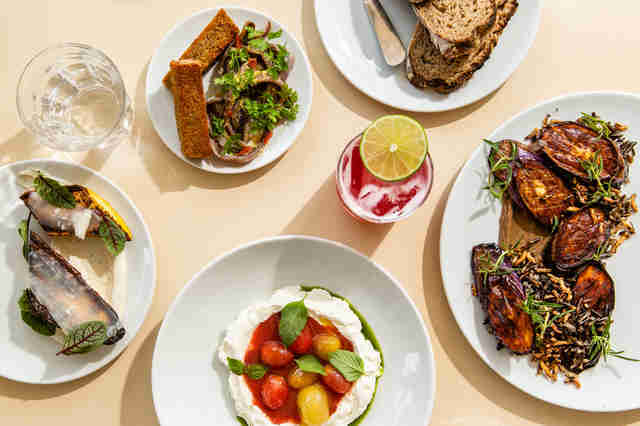 Miss Ada’s narrow, unmarked storefront is easy to miss from the outside, but the kitchen turns out memorable Israeli fare under Chef Tomer Blechman (Lupa, Gramercy Tavern, Cookshop). 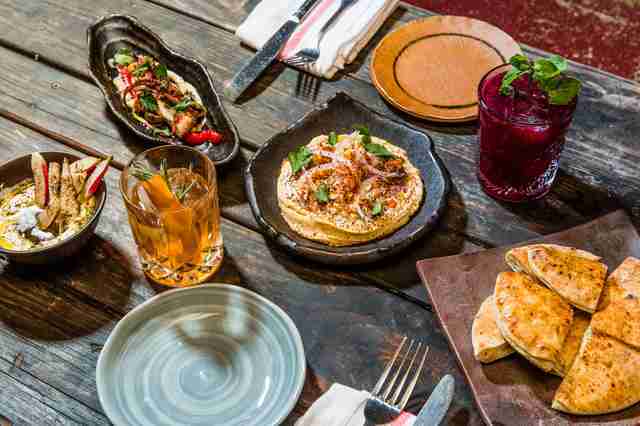 Salivate over sweet potato hummus with paprika oil and almonds, short rib in a specialty Israeli mole, and za’atar-crusted salmon with housemade labne and Japanese eggplant. The pita, alone, might just change your life. Toast to Blechman’s Russian relatives with a shot of Beluga vodka and pickled mushroom in the sunny dining room before your meal arrives. Dining at Olea is easy. 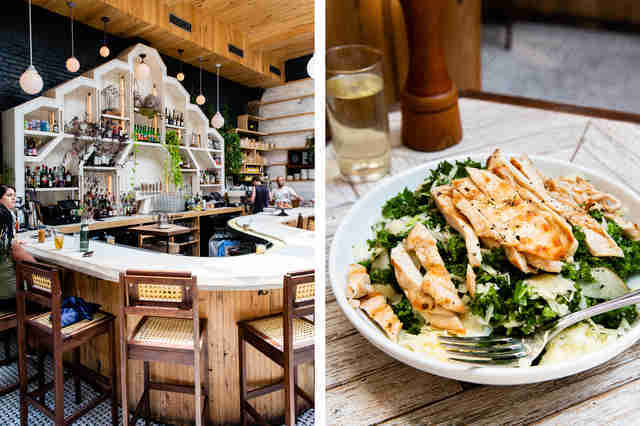 The neighborhood spot rarely has a wait, the Pan-Mediterranean fare will please most palates, and the tree-lined streets outside seem to seep into the flora-filled interior. Come for happy hour and sip sangria over a lengthy list of $2-$8 tapas (think almond-stuffed bacon-wrapped dates, harissa-deviled organic eggs, and housemade tzatziki). Pace your unlimited pita-refills and reward your temperance with the dinner menu’s daily paella. 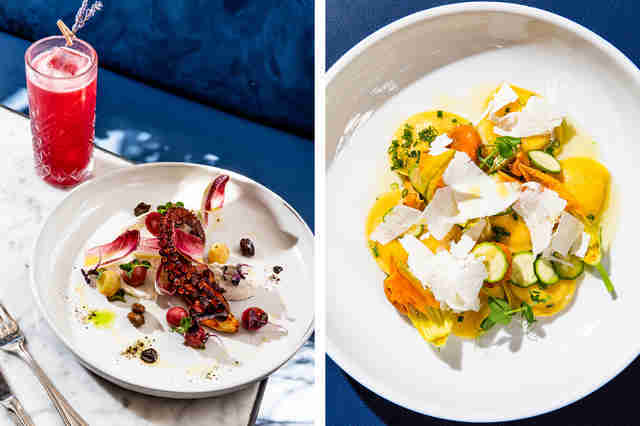 The sister restaurant to Williamsburg’s Walter Foods has its own North Brooklyn edge -- dark, repurposed wood, a carefully curated cocktail menu, and a reliably well-dressed twenty-something crowd. 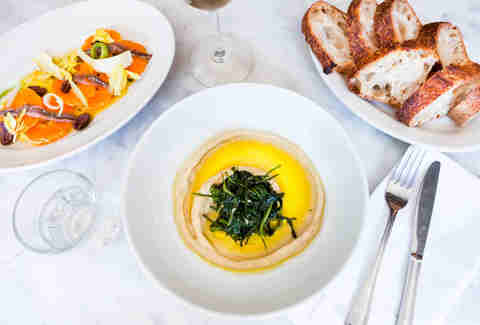 Equally popular for towering, eggy brunch plates, and evening oyster-martini pairings, it’s an all-occasion sort of spot. From 9am, until well after midnight, bow-tied waiters ferry plates of French toast studded with caramelized banana, raw bar bites, and hefty portions of tender wagyu beef arranged on fresh baguette. And go ahead and peek behind the unmarked door in the back . . . If Walter’s weren’t hip enough on its own, the eatery’s adjoining speakeasy-style Japanese cocktail spot certainly finishes the job. 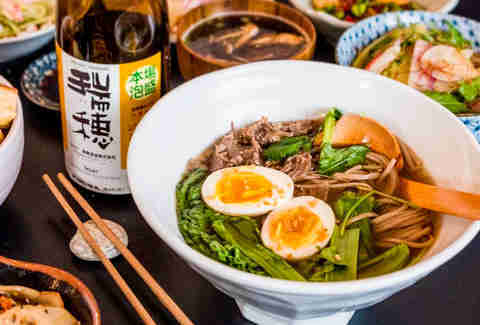 In-the-know imbibers can slink past tables of burger-munching locals, and into the minimalist navy and gold space for a lengthy menu of Izakaya-style shared plates. Bolder even than the lotus-burdock salad, and the hard shell clams with ponzu sauce, are the cocktails. Impress your date with your enigmatic neighborhood knowledge and and order a sphinx -- gin, umeshu, vermouth, and akajiso vinegar served straight up. The phrase “steps from the subway” gets thrown around a lot in NYC, but No. 7 is actually about two steps from the Lafayette A/C stop, depending on your stride. The spot stays neighborhoody in spite of its accessibility, and locals gather to chat in the warm, candle lit space until 2am on Friday and Saturday nights. 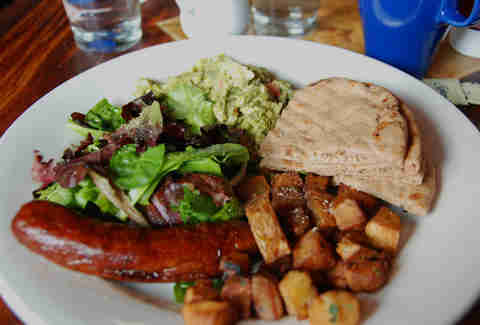 Healthy, mostly vegetarian-friendly items fill the menu -- a welcome break from the standard bar food routine. 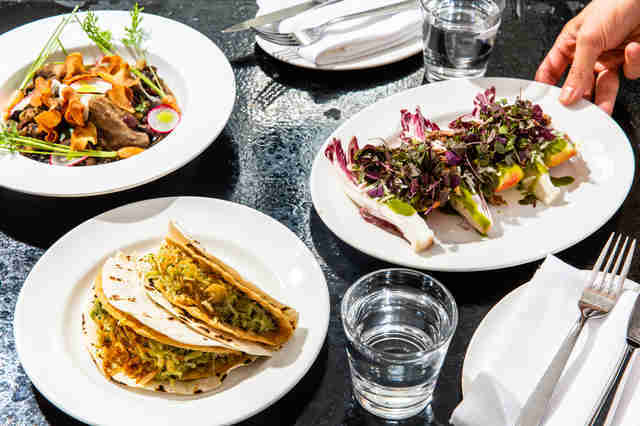 Stop in for a casual weeknight dinner, and plow through broccoli tacos, buckwheat gnocchi, and an endive-apple salad without teetering near the edge of a food coma. Uncooked food fans flock to the raw bar at The Quarter, where the oyster selection changes daily. There’s fare for the squeamish seafood fan, too, like the crispy calamari, pan-seared salmon, and mussels. Homemade cavatelli, roasted chicken, and a New York strip steak round out the dinner menu. Dim lights and novel cocktails you’ll want to share (try the vodka brulee with apple puree, lemon, egg white, and caramelized sugar) combine to make this a prime date spot. Opt for a cheese and charcuterie combination if you aren’t sure you’re ready for a dinner with your Tinder-match. The peaceful backyard at Colonia Verde is nearly indistinguishable from its sun-drenched, greenhouse-like dining room, save for the fact that the climate-controlled latter can be enjoyed on less-than-temperate days. The food borrows from the best of Latin-American and Mediterranean cuisines to delightful fusion effect: whole roasted cauliflower head is marinated in red mole, pork belly arepas are served with maple syrup and cotija cheese, and grass-fed burgers are topped with cilantro-pesto. The wine menu is carefully calibrated to complement the equally thoughtful menu. Otway is the sort of place folks will whisper about with their neighbors, but not with their Manhattan-residing friends. The blink-and-you’ll-miss-it space on a quiet corner just off of St. James Place could be nearly anything from the outside, and no matter how many tables are occupied, you’ll feel like you’ve discovered something new. 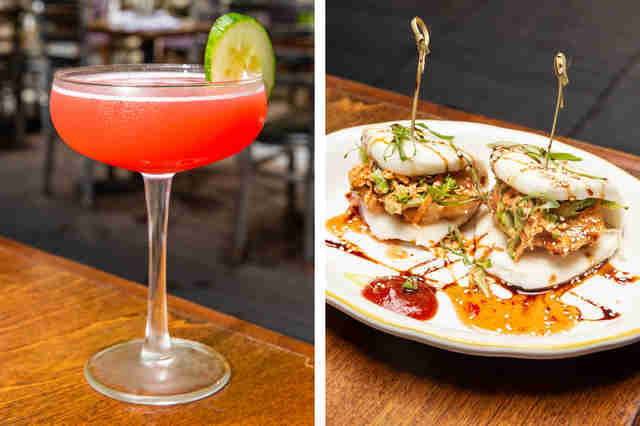 The all-woman staff shakes and stirs spirit-forward cocktails, and plates delicate dishes like cured hamachi with tapioca and scallion aioli, and roasted eggplant with wild rice and dandelion. The kitchen, however, is not so dainty -- you’ll find a whole-animal butchery behind closed doors. Pizza snobs and Instagram goblins have been blabbing about Emily for well over a year. Well the rumors are true, and the pizza here is just as good as they say it is. 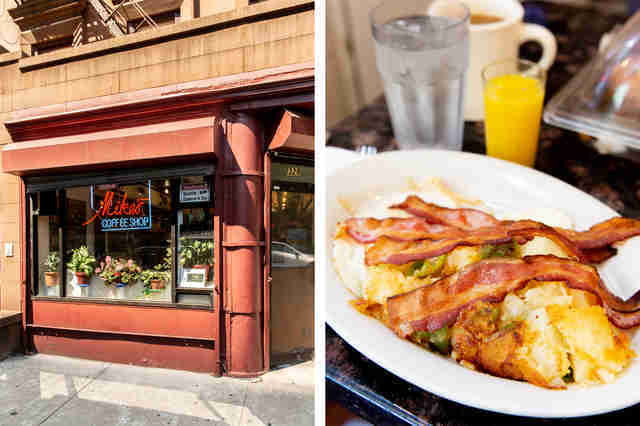 Hit the mini-chain’s OG Clinton Hill location if it’s your first time. 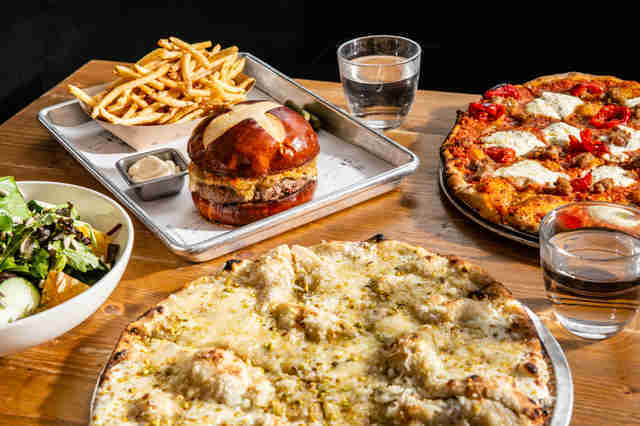 Once you’ve nabbed a seat in the narrow, no-frills dining room, dig into a few of the spot’s signature, thin-crust personal pies. The Emily, topped with truffle sottocenere ham, mozzarella, honey, and pistachio, is a must-try. We’ve been told the burger is unforgettable, too, but it’s nearly impossible stray once you’ve laid your eyes on the pies. This seasonal-American spot on the ground level of a century-old building radiates romance and modest charm. The cozy, uncrowded dining area flows easily toward an L-shaped bar and bustling open kitchen. With Gabe McMackin (Blue Hill, Roberta’s, Gramercy Tavern) at the helm, The Finch earned its Michelin star just 10 months after opening -- a Herculean task for an outer-borough newcomer. The impossible suddenly seems possible once you’ve tasted the food. Chicken liver mousse comes garnished with sour cherries, roasted pork belly arrives melting into a bed of sliced peaches and fresh basil, and squid ink tagliatelle dances with littleneck clams. Aita is the kind of Italian dining that’s often imitated, but not quite replicated, in “the city.” Homey touches like rustic, paned windows, uniform hardbound books, and mismatched picture frames brighten the space’s dark wood floor and furniture. 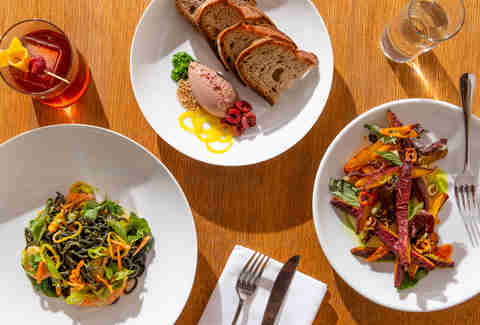 Plates are unfussy and generous -- bucatini with porchetta, burrata with heirloom tomatoes, squash caponata are all served in heaping portions -- none of that one-arugula-leaf-per-plate nonsense. 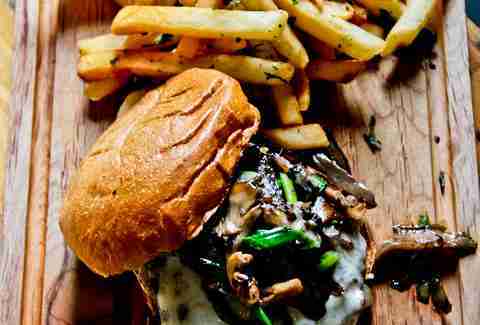 Walk-ins take priority, and a large communal table is suitable for large parties. Keep this one in your pocket for the next time all your cousins visit from wherever the hell your cousins are from. This sweet little stumble-inn spot could easily be mistaken for a private yard, were it not for the minimal signage distinguishing it from the block’s residential buildings. 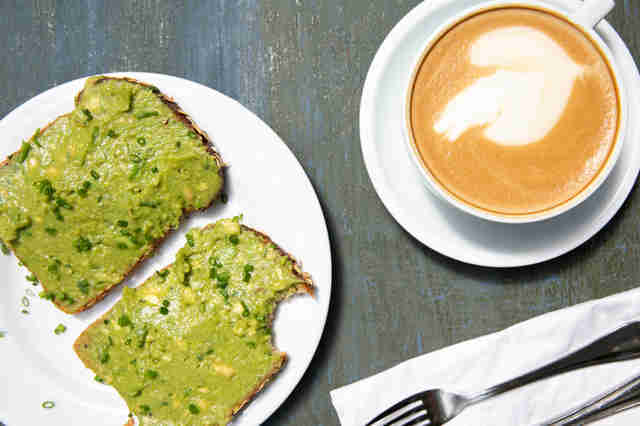 The clubhouse-like cafe serves coffee, tea, and matcha in ceramic mugs, along with a relatively outsized menu of pastries, egg dishes, sandwiches, and salads. It’s no place to write home about unless you live in the neighborhood, in which case you will fall head over heels in love with the fact that this is your local coffee shop. There’s a tidy little backyard, too, and in the afternoon, the place serves beer and wine, so you can cap off your day of reading, cross-wording, or conversing with something a little harder. Sisters is among the scene-ier venues drawing crowds from Brooklyn’s more northern neighborhoods -- maybe because it’s so hard to miss. A giant clock embedded in the former hardware store’s facade always seems to point to mealtime. Brunch here is best, when the curved marble bar and tidy row of tables are bathed in sunshine through a skylight. Sure, you’ll have to wait for a seat, but once your frittata and your pulled pork-topped savory French toast arrive, you’ll forget all about that big timepiece outside. The place transforms into a buzzy cocktail bar after dark, and a vibrant dance destination on weekends.